Thailand is located in Southeast Asia between latitudes 5o 37’ N and 20o 27’ N and longitudes 97o 22’ E and 105o 37’ E and cover area of 518,000 km2. It is bounded to the west by Myanmar, to the north by Myanmar and Laos, to the east by Laos and Cambodia, and to the south by Malaysia. Physiographical, the country can be divided into four regions; the mountainous highland in the north and northwest, the khorat plateau in the northeast, the central plain and the southern peninsular, which are between Andaman Sea and the Gulf of Thailand. Geologically, Thailand consists of rocks range in age from Precambrian to Quaternary. b. The common lithologic associations of these rocks are mainly granitic to granodioritic paragneisses, mica schist, hornblende schist or amphibolite, calc-silicate and marble of the Almandine Amphibolite Facies with frequent collaboration of orthogneiss, migmatite, pegmatite, aplite and granites. c. They are usually associated with Lower Paleozoic rocks of the Greenschist Facies, which grade into a mildly metamorphosed and unmetamorphosed rocks of the younger succession. d. Due to the lack of outcrop continuation between the Amphibolite Precambrian rocks and the Greenschist Lower Paleozoic rocks, an unconformity is usually proposed, however, this has never been really observed. e. Except the unmetamorphosed Lower Paleozoic rocks at Tarutao island, elsewhere their grades of metamorphism are rather constant within the Greenschist Facies range and more or less parallel with the associated upper Amphibolite Facies of the Precambrian rocks. This is supported by observations in most cases that, the original bedding and cleavage or schistosity are usually parallel. f. Commonly rock types and age consistencies between the lower part of the Lower Paleozoic and the upper part of the Precambrian rocks are usually observed in various places. g. Very likely, the original rock types of the Precambrian before the regional metamorphism were a thickly alternating sequence of impure arenaceous to argillaccous sediments with mainly impure carbonate and rare siliciclastics. A rather mafic constituent may represent an involvement of mafic volcaniclastics. h. The Lower Paleozoic rocks have been thought to represent the siliciclastic carbonate facies of the shelf deposit. i. Structural analysis has been rarely investigated. The available studies reached the same conclusion that there were at least two episodes of regional metamorphism and two periods of cataclastic deformation. For the second regional metamorphism, only local overgrowths have been quoted as the verified indication. Apparently there is no prevail cutting across among schistosity or cleavage has been witnessed. Local evidence suggests against the second regional metamorphism. More recent and specific studies on the Precambrian rocks from various parts of the country have more or less confirmed the afore mentioned scenario as being summarized below. j. Review of the mineral assemblages from various regions contradicted the earlier report of the type of metamorphism. They indicate the Cordierite Amphibolite Facies of the Abukuma Facies Series (LP/HT) rather than the Almandine Amphibolite Facies (IP/IT). k. Superimposed contact metamorphism was evidenced by its unique mineral assemblages contradictory to those that are presented in the regional metamorphism. Geochronological studies dated such contact metamorphism at Cretaceous time. l. PT condition of the regional metamorphism has been evaluated from the observed mineral assemblages relative to the relevant experimental results and came up with 3.5 - 4 Kb pressure and 650-660 oc for the formation. m. Geochronological studies gave two different ages of metamorphism at around Triassic/Jurassic boundary and Cretaceous. However, the Precambrian rock pebbles being found in the nearby Mesozoic red beds favors the metamorphism that took placed during the Triassic/Jurassic boundary. n. A singular metamorphism supports a transitional or gradational contact between the Amphibolite Precambrian rocks and the Greenschist Lower Paleozoic rocks. Furthermore, there has been no observation to verify that the older rocks of Precambrian have been served as a source for the younger Lower Paleozoic rocks. o. Original sedimentary rocks before metamorphism were investigated by Rb/Sr small slab technique and gave the depositional age of around 600 Ma. The Lower Paleozoic rocks of Thailand are subdivided into the lower Lower Paleozoic rocks ranging in age from Cambrian to Ordovician and the upper Lower Paleozoic rocks ranging in age from the Silurian to Devonian, and up to the early Carboniferous in some rock units. In Shan-Thai Terrane, these rocks are widespread in western mountain area extending from Kanchanaburi Province in the west to Chiang Mai, Mae Hong Son and Uttaradit Province in the North; and to Chon Buri in the east. The rocks in the Peninsula are widely distributed in northsouth direction alongside of Khao Luang mountain range, extending from Surat Thani Province through Nakhon Si Thammarat and Satun Province to North Malaysia. In Indochina Terrane, only the upper Lower Paleozoic rocks are exposed in northeastern part of Loei Province extending in north-south narrow belt across Thai-Laos border to Western Laos. In general, most of the lower Lower Paleozoic rocks of Thailand have been subjected to low grade regional metamorphism (greenschist facies) and contact metamorphism in the area close to granite. The rocks are also strongly folded and faulted. These rocks are closely associated with and lie unconformable above the Pre-Cambrian high-grade metamorphic rocks in Shan-Thai Terrane. The lower Lower Paleozoic rocks of Thailand can be divided into two conformable rock units : a lower siliciclastic, the Tarutao Group, and an upper carbonate, the Thung Song Group. The Tarutao Group at the Tarutao Island, Satun Province, is a thick sequence of red sandstone, siltstone, shale and conglomerate with the Late Cambrian trilobite on the upper part of the sequence. However, most of the rocks on the mainland are quartzite. This group is a shallow shelf sequence periodically subjected to storm. The overlying Ordovician Carbonates, the Thung Song Group, is a thick sequence of tropical limestones, dolomites and calcareous shales. At least seven distinctive lithostratigraphic units have been recognized in the South as the Malaka Formation, Talo Dang Formation, La Nga Formation, Pa Nan Formation Lae Tong Formation, Rung Nok Formation, and Pa Kae Formation. The Pa Kae Formation is the red stromatolitic limestone proposed for the uppermost Formation of the Thung Song Group in the South. They were deposited in peritidal environment on a homoclinal ramp during a long marine transgression in Early Ordovician, followed by shoaling, reefs, and a deeper subtidal in a Middle, and a greater deepening during the Late Ordovician. Lithologically, the carbonate rock of the Thung Song Group is very similar throughout Thailand. However, the age of the similar rock unit in the east is still in controversy. The Cambrian-Ordovician boundary lies within the top most part of the Tarutao Group whereas the Ordovician–Silurian boundary is placed in the black graptolitic shale of the upper Lower Paleozoic rock, the Wang Tong Formation, about 25 meters above the Pa Kae Formation. The upper Lower Paleozoic rocks of Thailand which lies conformably above the Early Paleozoic Rocks can be differentiated into 2 major north-south facial belts, the shelf-basin in the west and the Peninsula, and the magmatic arc facies in the Sukhothai Fold Belt and Eastern part of the Peninsula. The rocks in the west from Kanchanaburi to Mae Hong Son Province and the Peninsula are black graptolitic and tentaculitic shale, chert, sandstone, siltstone and variegated stromatolitic nodular limestone of shelf to back-arc basin facies. These rocks were formerly referred to as the Tanaosi Group and Kanchanaburi Group but now they are defined as the Thong Pha Phum Group. In the Peninsula from Surat Thani to Satun Province, this rock is represented by a continuous succession of those deeper water siliciclastic and carbonate rocks. At least three conformably lithostratigraphic units have been recognized in Satun Province. They are the Wang Tong Formation, Kuan Tung Formation and Pa Samed Formation. Studies on the graptolite, trilobite, brachiopod, ammonite and conodont by many paleontologists from Australia, England, Japan and USA. reveal that the upper Lower Paleozoic rocks of this shelf-basin facial belt in the Peninsula are ranging in age from Late Ordovician to Early Carboniferous. They seem to be conformably underlied the Upper Paleozoic rocks. However, recent study on deeper water fossils from the Pa Samed Formation of Prof. Boucot and his colleagues indicates the presence of a major disconformity between the Emsian dacryoconarid-rich beds and the overlying siliciclastics that have yielded Carboniferous faunas. The upper Lower Paleozoic rocks in the Sukhothai Fold belt of Shan Thai Terrane, in Eastern part of the Northern Highland, the Eastern Gulf and Eastern part of the south can be separated into three facial belts including 1) back-arc-basin facies in the west, 2) volcanic arc facies in the middle, and 3) inner trench stope facies of fore-arc in the east. The lithostratigraphic nomenclatures of the Upper Paleozoic strata in Thailand have been summarized and correlated. The Mae Tha Group, Dan Lan Hoi Group, Doi Kong Mu Formation and Fang Redbeds represent the Carboniferous strata, whereas the Phrae Group has been designated for the Carboniferous-Permian succession in the Northern and Upper Western Region. The Nong Dok Bua, Wang Saphung, Dok Du and Huai Som Formation represent the Carboniferous strata in Loei-Petchabun Ranges region. The Kuan Klang Formation has been assigned for the Carboniferous rocks, whereas the Kaeng Krachan Group that contains pebbly mudstone and sandstone represent the Carboniferous-Permian strata in Lower Western and Southern region. The Ngao, Saraburi, Chanthaburi and Ratburi Groups represent the Permian strata in Northern and Upper Western, Loei-Petchabun Ranges, Eastern, and Lower Western and Southern regions respectively. Mesozoic rocks of Thailand consist of both marine and non-marine deposits. Whereas the marine rocks are well distributed in the northern, western and southern parts of the country, the non-marine rocks are widespread in the northeastern part (Khorat Plateau) and partly in the southern peninsula. The marine rocks consist mainly of limestones, mudstones, sandstones, dolomites, and conglomerates having been deposited in submarine fan and shallow water environments. These rocks range in age from Lower Triassic to early Middle Jurassic on the basis of the ammonites, bivalves and additional data from microfossils and stratigraphic correlations. 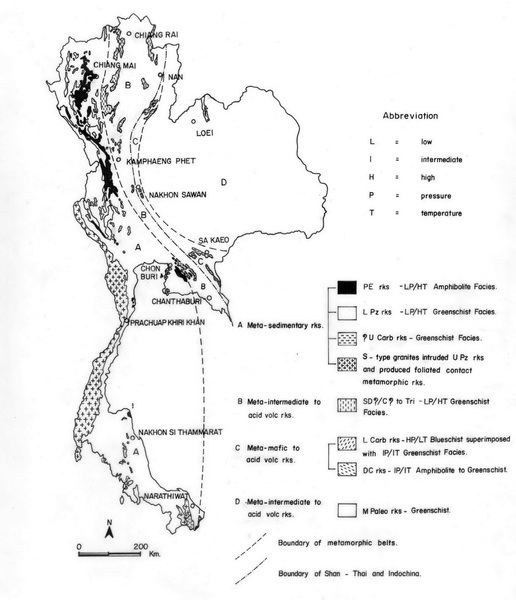 The revised lithostratigraphic units and correlations for the Triassic Lampang Group are summarised including other units in various parts of Thailand. In the Jurassic Period, twelve new lithostratigraphic units have been established for the marine Jurassic rocks in the Mae Hong Son, Mae Sot, Lamphang, Kanchanaburi, Chumphon, and Nakhon Si Thammarat areas. The brackish facies of the Middle Jurassic Khlong Min Formation in southern peninsula is also briefly reported. The Toarcian-early Bajocian age (upper Lower-lower Middle Jurassic) is confirmed so far for the Thai marine Jurassic. The marine Cretaceous rocks have not yet been reported elsewhere in Thailand. The non-marine Mesozoic rocks in the Khorat Plateau belong to, in ascending order, the Huai Hin Lat, Nam Phong, Phu Kradung, Phra Wihan, Sao Khua, Phu Phan, Khok Kruat, Maha Sarakham and Phu Thok Formations of the Khorat Group. Reddish-brown to light-grey sandstones, conglomeratic sandstones, siltstones, claystones and conglomeartes are the main lithologies of these rocks; calcrete nodules and silcretes are also present in claystones but salts and gypsum are found only in the Maha Sarakham Formation. The rocks are interpreted as having been deposited by the meandering and braided rivers in semi-arid to arid conditions. Age determinations are based mainly on vertebrates, bivalves and palynomorphs indicating that the rocks are reassigned to the late Upper Triassic to Upper Cretaceous-Lower Tertiary. In the southern peninsula, the non-marine rocks consist of reddished brown claystones, siltstones, sandstones, and conglomerates. These rocks are interpreted to be deposited by both meandering rivers and alluvial fans. The small outcrops of the non-marine rocks other than the northeastern and southern parts are also noted. Tertiary intermontane and rift basins in Thailand share some similarities in origin, timing, sedimentary environments, and basin structural styles. These similarities corresponded with northward movement of the India terrane. Those basins in the south formed relatively earlier than in the north, and those in the west earlier than in the east. Alluvial environments dominated in the lower and upper parts of the basin, while lacustrine, fluvio-lacustrine and swamp environments were predominant in the middle part. They contain major deposits of petroleum, coal, oil shale, diatomite and ball clay of the country. 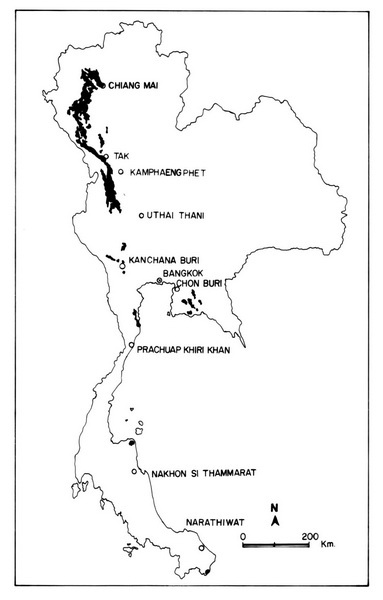 Tertiary sedimentary basins in Thailand occurred throughout the country as intermontane and rift basins, except the Khorat plateau, with long axis of the basins normally oriented in N-S direction that were related to the collision of India with Asia. Most of them show graben and half-graben geometry. At present, at least 70 Tertiary basins have been named with most of large basins also contain numbers of sub-basins. These Tertiary rocks are poorly exposed in natural outcrop and covered by Quaternary sediments except in the margin of the basin where the rocks were often brought to the surface by faults. As a result of post- as well as syndepositional faults, the present Tertiary configuration is a remnant of an original larger basin that was uplifted and eroded. Study of these rocks in the past was quite difficult due to scare published papers and most of subsurface data are confidential. It is realized that these rocks are so important not only as source rocks and reservoirs of oil and gas, but also accumulation of coal, oil shale, diatomite and ball clay. Mining activities were performed in several basins i.e. coal of mainly lignite and sub-bituminous ranks from Mae Moh, Mae Than, Chiang Muan, Bo Luang, Li, Nong Ya Plong, and Krabi basins with prospective reserves in number of basins such as Wiang Haeng, Ngao, Wang Nua, Chae Khon, Mae Ramat, Mae Lamao, Khian Sa, Saba Yoi; petroleum from Phitsanulok, Supan Buri, Fang, and basins in the Gulf of Thailand; ball clay in association with coal from Mae Than basin; diatomite from Mae Tha sub-basin of Lampang basin. Huge oil shale deposit was found in Mae Sot basin. Quaternary geology is the study of all geological events that took place in Quaternary period. This period subdivided into 2 epoches, Pleistocene (1.8 m.y.-10,000 yr.B.P) and Holocene (10,000 yr.B.P-present). Quaternary is a period concerning with climatic change, sea-level change, and changing landforms. Migration of lives on the earth surface, and human evolution also taken in this period. Quaternary geologic sequences of Thailand cover one-third of the total area. They are mainly semiconsolidated and unconsolidatd sediments, including some quick crystalline and lithified volcanic rocks such as basalt. Formerly, Quaternary sediments were poorly understood because of unexposures, thick accumulation of unconsolidated sediments and inaccessibility of subsurface data. The classification of Quaternary sediments in Thailand is based on geomorphology, lithology, depositional environments and fossils. Generally, Pleistocene deposits are related to neo-tectonics, changing of alluvial and fluvial systems, weathering in-place of the bed rocks, and evidences of sea-level change in restrictive areas. Appositionally, Holocene deposits are concern mainly with climatic changes and marine sediments relating to the great fluctuation of sea – level. The present coastal area of Thailand was derived by inundation of Holocene sea- level. While in the upland area flood plain, levee, and young alluvial fan were developed. 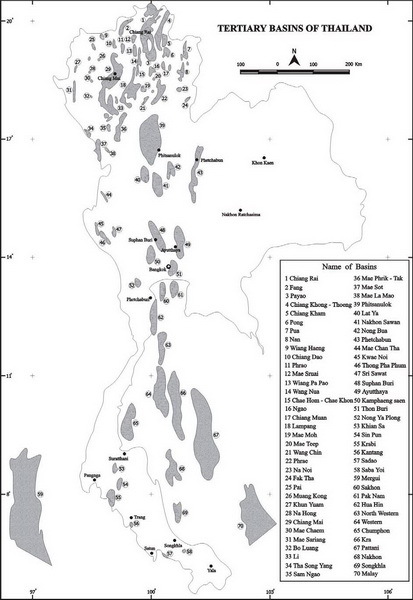 Quaternary stratigraphy of Thailand is differed in each physiographic region. The result of study is advantage in Holocene marine deposits and coastal zone studied while in the upland area, the Pliestocene deposits are almost concealed. The stratigraphic succession has been acquired from subsurface data, quarries, and road cut sections. Inaccessibility of data in many areas caused difficulty in stratigraphic correlation among physioraphic regions, and it must be solved with the revealed data of future geological research. Igneous rocks are widespread in Thailand. Among them, granites are the most common constituents whereas, intrusive rocks of intermediate, mafic, ultramafic composition and volcanic rocks are subordinate. The Thai granites were lineated in three major belts, from east to west, the Eastern Belt Granites (EBG), The Central Belt Granites (CBG) and the Western Belt Granites (WBG). The EBG show strong correlation with the I-Type granites or Magnetite Series whereas, the CBG show S-type or Ilmenite Series affinities. Majority of the WBG are S-Type with minor amounts of the I-Type or Ilmenite Series granites. Emplacement ages of these granites, in a broad sense, appear to decrease westward from Lower Triassic in the east to Late Cretaceous in the west. Widespread discordant isotopic ages in these granites are observed and considered to be subjected to a number of causes, such as metamorphism, tectonic deformation, hydrothermal activities and simple cooling processes. Gold, copper, base metals, iron and barite are common economic minerals occurred in the EBG whereas, tin, tungsten, and fluorite are more common in the CBG and tin, tungsten, columbite, tantalite and REE minerals are much more abundant in the WBG granites. Gabbro, peridotite, pyroxenite, hornblendite, and serpentinite are common intrusive mafic and ultramafic assemblages and were interpreted as ophiolite suite. They expose as three discontinuous narrow stripes from north to south, the Pha Som Ultramafic (Nan-Uttaradit), Sra Kaeo Ultramafic and Narathiwat Ultramafic. The maficultramafic belt is considered to be a palaeo-suture, separating the Shan Thai Block in the west from the Indochina Block in the east part of the country. Age of the Pha Som Ultramafic have been reported as Early Permian (269 _12 Ma) and Carboniferous to Early Permian (356-256 Ma). Volcanic rock assemblages are widely distributed in most parts of Thailand and can be broadly grouped into the Permo-Triassic, Chiang Mai-Chiang Rai Volcanic Belt, the Permo-Triassic to Jurassic with some minor Late Tertiary Ko Chang-Tak-Chiang Khong Volcanic Belt, and the Late Cenozoic Basalt. Economic mineral deposits within the early two volcanic groups comprise gold, copper, manganese, iron and barite, bentonite, dickite, Kaolinite and perlite. In contrast, some Late Cenozoic Basalt carried gemstone in particular, ruby and sapphires. Metamorphic rocks in Thailand have been provisionally subdivided into four belts, arcuatedly elongated in a north-south direction, and roughly corresponded with the known litho tectonostratigraphic belts. Starting from west to east, the western most belt-A, where, the metamorphic rocks of the belt possess a continuous sequence, in terms of both stratigraphy and grades of metamorphism, from inferred Precambrian to probably Middle or Upper Paleozoic rocks. They were metamorphosed in the Abukuma Facies Series, producing Amphibolite in the inferred Precambrian rocks and graded to Upper Greenschist the Lower Paleozoic rocks. It is still debatable to how and when this metamorphism was generated. The second and third metamorphic belts (B and C) are more geochronologically diverse, however, either of them tends to be restricted more or less in a similar lithologic provinces. The second belt-B represents the first eastward appearing of the volcanogenic metamorphic rocks. They are calc-alkali and apparently were metamorphosed in the high temperature-low pressure regime. Their distributions are rather patchy and localized, forming a longitudinally disconnected or terminated volcanogenic chains. Transition sideward across the stratigraphic column seems gradational to unmetamorphosed rocks. The rock sequences vary in ages from Silurian/Devonian, Carboniferous, Permian and Triassic and are younging eastward to the margin of the belt, the Nan Suture. These metavolcanogenic rocks indicate eastward reappearance during their formations and is related to the westward accretion along the Nan Suture. The third belt -C lies roughly coincide with the Nan palaeo-suture zone. The metamorphic rocks in this belt are probably subduction related and consist of metamafic to acid volcanic rocks characterizing by a lesser evolved material. Imprint of the IP/IT Greenschist Faciess over the HP/LT Blueschist Facies in Nan may connote other unknown tectonic movement rather than ordinary adjustment of the PT regime by uplifting. The IP/IT Greenschist to Ampholite Facies in eastern part of Thailand reflects a different PT condition. Age differences between the Early Carboniferous in Nan and the Devonian-Carboniferous in east Thailand may suggest their differences in subduction regimes. The fourth metamorphic belt-D is isolated and limited in extense lying in a north-south elongation in the northern end of the Khorat Plateau. The rocks were weakly metamorphosed and are the only metamorphic chain in this region. They represent a unit in a thick and continuous sequence ranging in age from Silurian to Upper Devonian and probably related to the western subduction regime under the Indochina block. Thailand, tectonically consists of two major Gondwana derived terranes, namely Shan-Thai to the west, and Indochina to the east, that were amalgamated along Nan-Uttaradit suture during Late Triassic, although opinions on moving history vary. Different in their stratigraphies, particularly during Carboniferous to Triassic, strongly supported this interpretation. Indochina terrane drifted away from the Gondwana in Late Devonian, as suggested by radiolarian assemblages from chert in the suture zone. These were continuously followed by Carboniferous clastics and Permian platform carbonates exhibited Cathaysian affinity. While Shan-Thai terrane was adjacent to NW Australian part of the Gondwana till Early Permian, as evidenced by not only stratigraphic similarity from Cambrian to Early Permian but also close faunal affinities in particular during Cambrian to Devonian. Discovery of Devonian to Middle Triassic deep sea thin-bedded chert, and Cathaysian fauna in Carboniferous to Permian limestones in northern Thailand where formerly mapped as part of the Shan-Thai terrane, led to interpretation of major Paleotethys ocean with occurrence of seamount limestones in low latitude area. 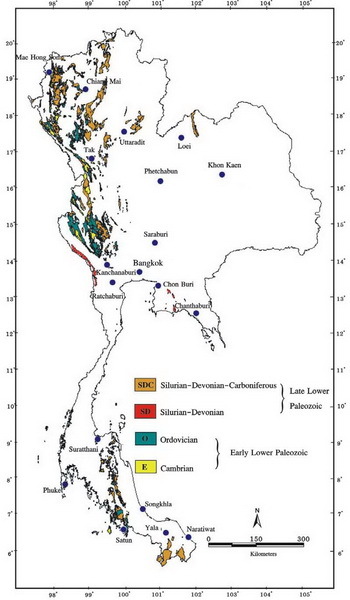 Occurrences of Lower Paleozoic clastics and fauna in the northern Thailand similar to those of Shan-Thai terrane suggest they were also derived-fragments of the Gondwana. Subsequently, new suture zones of the Paleotethys have also been proposed in Chiang Mai and Mae Sariang areas. However, westward subduction of the Indochina terrane beneath the Shan-Thai terrane along the Nan-Uttaradit suture is preferred. This interpretation is strongly supported not only by the presence of magmatic arc, Permian to Middle Triassic deep sea thin-bedded chert, Triassic forearc sediments and ophiolite rocks but also occurrences of syn- and post-subduction related plutonics. Precambrian rocks have been mapped with regard to their degree of high grade metamorphism. Sedimentary protolith from paragneiss was dated as around 600 ma. This was challenged by metamorphic core complex model that indicated the protoliths of orthogneiss were Late Triassic-Early Jurassic granites, experienced low pressure metamorphism and migmatitization in Late Cretaceous and Early Miocene. In the Shan-Thai, Upper Cambrian shallow marine siliciclastics with Trilobite cropped out only at Tarutao island, next to Malaysian border, whereas on the mainland consists mainly of quartzite. They were conformably overlain by Ordovician shallow marine carbonates and Silurian-Devonian fine-grained sediments with graptolite and tentaculite. Only in the southern peninsula, there were overlain conformably by Lower Carboniferous fine-grained sediments containing Posidonomya sp. Stratigraphic break or hiatus occurred widely on the Shan-Thai terrane during Late Carboniferous. Lower Permian glacial marine sediments cropped out mainly in the Peninsula, particularly the western part that could be traced northward to Burma and southwestern China, and southward to Malaysia and Sumatra. Depositional environment gradually changed to carbonate platform during Middle to Upper Permian. Faunal evidences indicated that during Middle Permian, the Shan-Thai terrane moved northward to a warm-temperate area between Gondwana and Cathaysia. During Late Permian, it still remained at a distance from the Indochina terrane, as suggested by faunal differences such as Shanita and fusulinadean. In the northeastern Thailand, hiatus occurred extensively during Early to Middle Triassic. By the Late Triassic, extensional basins were formed, and followed by a thermal subsidence that resulted in the continental deposition of Jurassic-Cretaceous red beds. Effect of continental collision between the Shan-Thai, then as a part of the Eurasia, and Western Burma terrane along the Shan Boundary during Cretaceous, and later during Tertiary from India and Eurasia that created huge Himalayan mountain belt, had greatly enhanced the complexity of geological structures in this region, in particular northern Thailand. 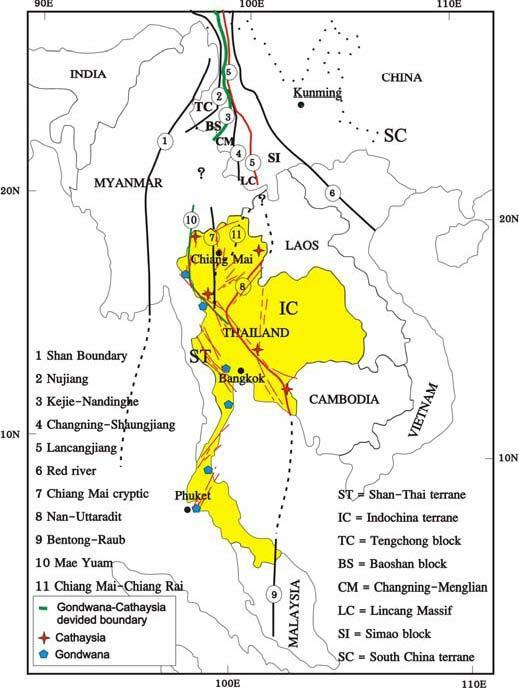 As a result, oroclinal "Sshaped” structural trends and clockwise rotation of NE Thailand caused by crustal movement was created prior to wide development of extensional Tertiary basins in the region. 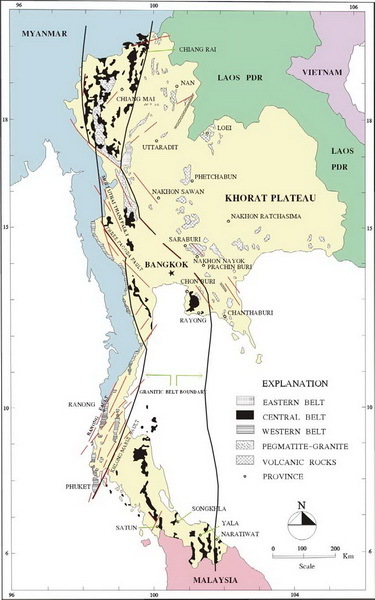 Granites in Thailand occurred in three north-south belts. The Eastern belt contains small batholiths of I-type Triassic granites. The Central belt consists of major batholiths showing S-type Triassic granites. The Western belt contained mixed population of S-type and I-type Cretaceous granites.